It took me 28 seconds to swap my factory original Tavor Trigger out for the brand new Tavor trigger from Timney Triggers. Editing the video to show how easy it is took a lot longer. The very fact that Timney and others are producing aftermarket triggers for the Tavor tells us something about America’s embrace of this Israeli bullpup rifle. Despite what many have derided as a poor trigger, IWI Tavor sales have exceeded expectations. In roughly a year’s time on market, 20,000 have been shipped. That’s three times their original projection! Almost universally, however, their triggers have been panned as sub-par. SHWAT™ Founders have been running a couple of Tavors for most of year now. With Fred Mastison from Force Options instructing, we did the first Tavor carbine class in America, finding the factory triggers to be adequate, but unimpressive. You can see the video of that class and our findings on our YouTube Channel. Triggers for AR15s and precision rifles have gotten so good in recent years that what once was acceptable isn’t any longer. Back when the HK91 and FAL owned the head space between the gun buyer’s ears, a heavy trigger was so normal it might not have made the discussion topic list. With the many quality drop in trigger options now available for our AR15s, a ten pound trigger pull on the Tavor is anathema to many who won’t ever use this bullpup rifle in battle. Unlike SHWAT™ Pro Staffer Fred Mastison, many people find a heavy trigger harder to shoot as accurately as a lighter weight trigger. Follow up shots are typically faster and easier with a short reset and lighter pull as well. The factory Tavor trigger seems to be reliable as the sunrise while at the same time unacceptably heavy in the minds of many. One solution offered on the internet was to remove one of the springs from the factory trigger pack. Apparently it’s non-essential in most situations. But most reputable writers indicated they wouldn’t count on such a modified rifle in a defensive situation. That might not bother some, but it does bother me. I want my gun to run right so consistently that I don’t ever have to wonder if my conditions are too adverse. And this might be an important detail to some: removing that spring voids the warranty. With that in mind, a 30 second drop-in trigger replacement that improves the function without voiding the warranty seems like a winning business plan. Three manufacturers have jumped on the Tavor trigger improvement program to date. At SHOT Show 2014, Timney and others showed off prototype trigger replacements for the Tavor. Timney seems to be the first to get triggers to the market, and I got one of that first batch. Inspecting the Timney versus the factory, you notice differences in the hammers. 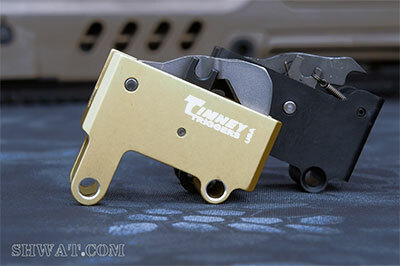 The Timney is bigger, yet the springs that push the hammer feel lighter than factory. In my one day at the range, the Timney Trigger functioned perfectly with the variety pack of ammo I put through it. To date, I’ve simply not had any issues with my Tavor, and it looks like the Timney trigger is on the right track to keep that streak going. Installation is a cake walk. Push two pins, pull out trigger pack. Put the Timney trigger into the Tavor and push the pins back. Done. Watch the video, it takes less than 30 seconds to swap those out. Timney claims a single stage 3.5-4 pound trigger pull on their Tavor trigger, and sure enough my scale reads exactly four pounds when the trigger breaks. Now that’s a huge improvement over my factory trigger. And while that is all well and good, we should address how the trigger feels. It’s not crisp, and I’ll debate anyone who claims otherwise. The Tavor trigger has some slack in it, whether it’s factory or the Timney replacement. Some might mistake that for a two stage trigger. Past that point, the trigger doesn’t break crisply. It’s more of a smooth roll. Some in the Three Gun competition circles prefer this type of trigger. Others don’t, but given the vast improvement over the factory trigger I think most shooters and hunters will agree it’s a win. Reset is very short and distinct. About the price of this Tavor trigger replacement… At $352 it’s essentially a 20% premium on current Tavor street prices. If you’re hoping one of the other manufacturers will be much cheaper, don’t hold your breath. So is it worth it? While that’s subjective, even though I find the factory trigger acceptable I cannot imagine a scenario where the heavier factory trigger would be preferred. I got my trigger directly from Timney. Aside from their website, I haven’t found their Tavor trigger anywhere else. If you’ve been holding off getting a Tavor due to the heavy factory trigger, now’s the time to make it happen. This entry was posted in Special Hunting Weapons & Tactics™ - The Center of Gravity for Tactical and Long Range Hunting and tagged Hog Hunting, Hunting, swine, Tactical Hog Hunting, Tavor, Timney, Trigger, wild hog hunting by Jonathan Owen. Bookmark the permalink.